Framed mourning print commemorating the death of four children from Parkerville, Kansas. This lithograph commemorates the death of Thomas Poole's four children?Martha (11), Ida (8), Clara (5), and Walter (4)?who were killed when their family's wagon capsized while they attempted to cross a flooded creek. 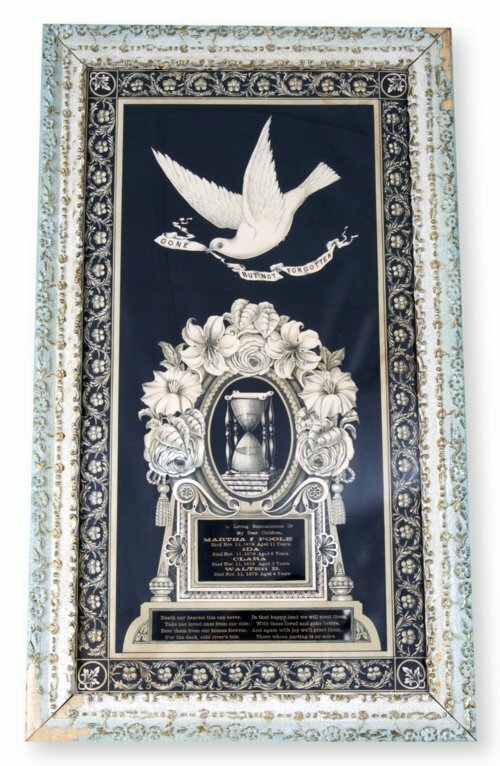 The lithograph features common 19th century mourning symbols, including a dove holding a banner reading "Gone But Not Forgotten," and an hourglass depicting the fleeting nature of life. The lost children's names and ages are emblazoned on a tablet near the bottom.